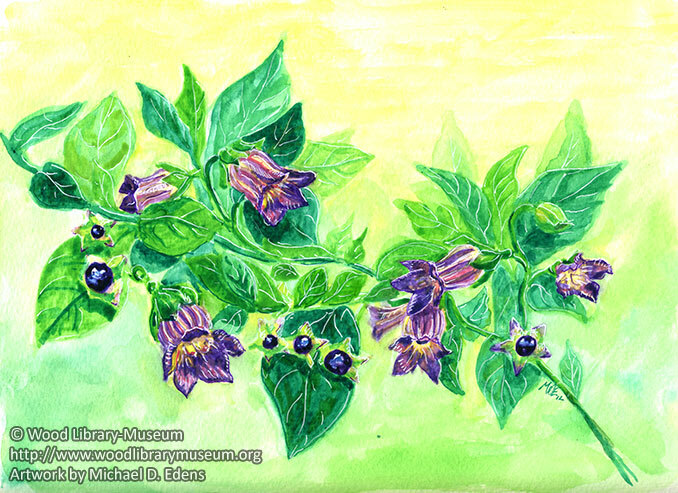 The following botanical paintings were created for the Wood Library-Museum of Anesthesiology as a series of note cards for sale. 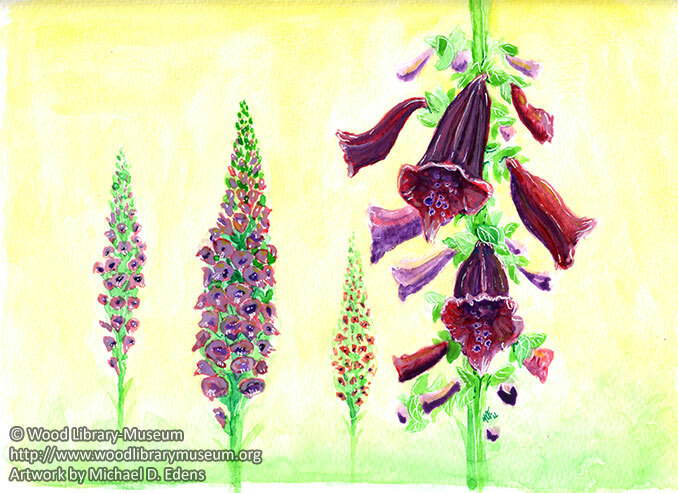 Each note card features a unique, distinctive botanical watercolor artwork of a medicinal plant: Papaver Somniferum (Poppy), Digitalis Purpurea, Chondrodendron Tomentosum (Curare), and Atropa Belladonna. 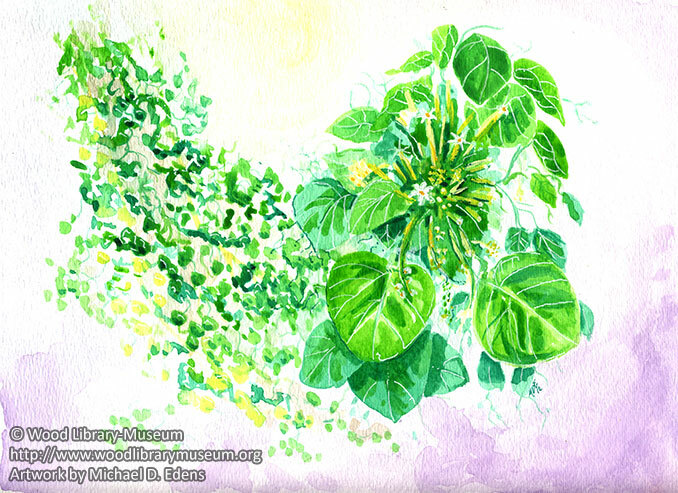 Each note card contains a detailed description of its medicinal qualities. There are 12 cards and 15 envelopes per set. Visit the WLM Store to purchase or view a sampling of the four note cards. The note cards are a beautiful and sophisticated gift for friends, family or colleagues, and proceeds support the world’s preeminent resource on the history of anesthesiology. This is an abstract drawing of a face. 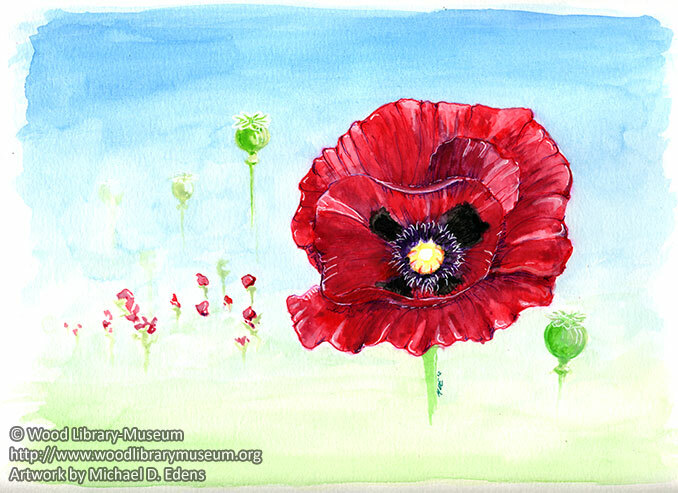 The artwork is 9″x12″, drawn and painted with colored pencils, pens, markers, paint pens, watercolors, and oil pastels. 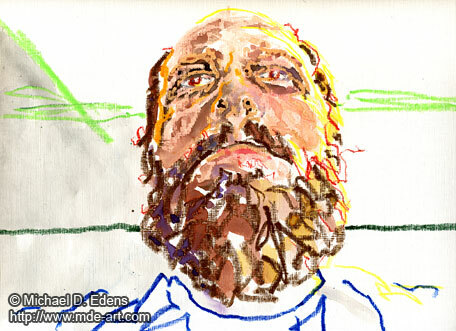 This is an abstract portrait of a man with a blue beard. 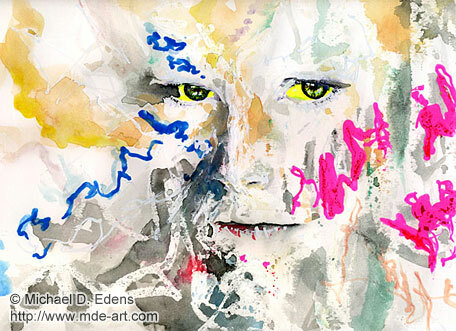 The 9″x12″ drawing was created with pens, markers, watercolors, oil pastels, and acrylic paint. 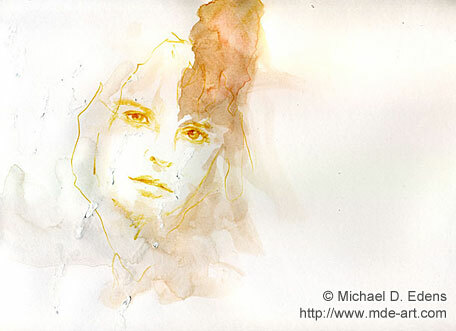 The following drawings of faces are a series of abstract portraits of women and girls. The 9″x12″ artworks were created with a variety of mediums, including watercolors, colored pencils, oil pastels, pens, markers, acrylics, and paint pens. 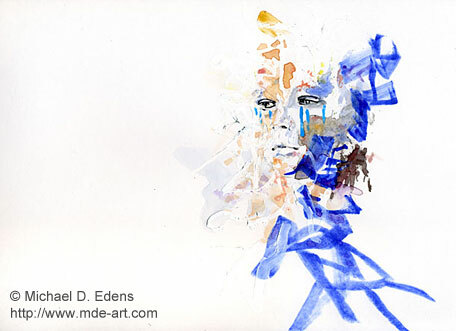 The following drawings of sad faces are abstract portraits of girls with different types of grief. 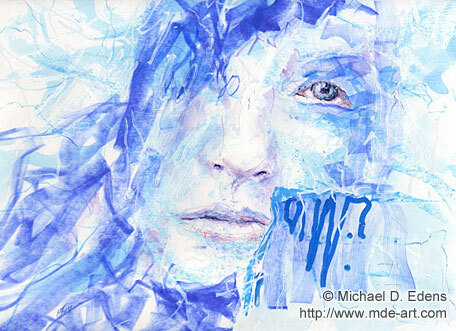 The 9″x12″ artworks were created with colored pencils, pens, markers, oil pastels, watercolors, and acrylics. 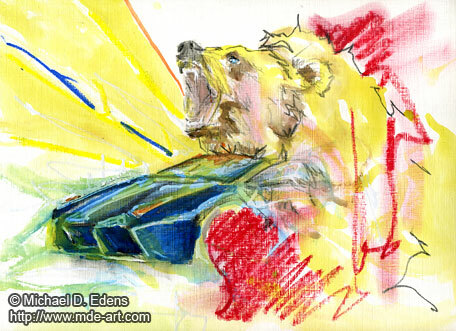 It’s a 9″x12″ drawing of a bear car, created with colored pencils, oil pastels, pens, watercolors, and acrylics. 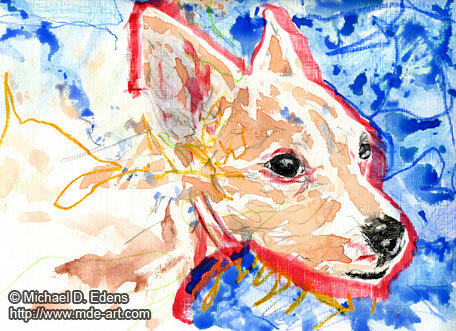 This is an abstract drawing of a dog entitled “Dream Dog”. The 9″x12″ artwork was drawn and painted with colored pencils, watercolors, pens, oil pastels, and acrylics. 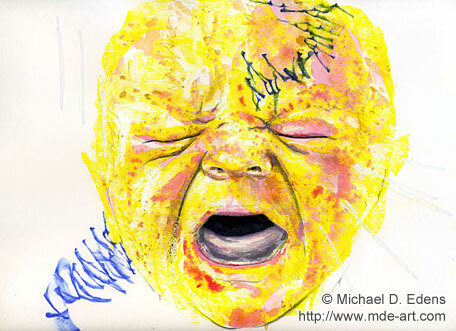 This is a portrait painting of a screaming baby entitled “Lemon Drop”. The 9″x12″ artwork was drawn and painted with colored pencils, watercolors, pens, markers, and acrylics. I think the baby feels a headache. This is a drawing of a burro with children. The 9″x12″ artwork was drawn and painted in 2011 with a variety of mediums, including colored pencils, watercolors, gouache, oil pastels, and acrylic. 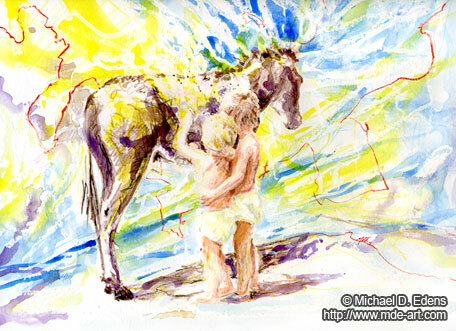 The children and burro were initially sketched with colored pencils, followed by meandering wisps of white oil pastel and acrylics in the background. 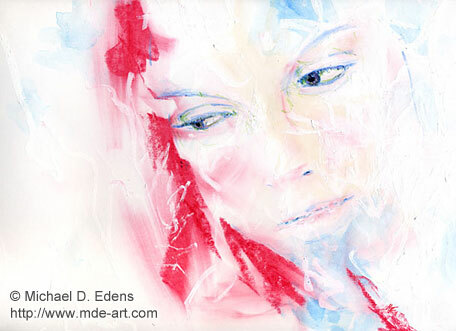 As layers of watercolors and gouache were applied, the oil and water repelled each other to reveal an energetic flow of light throughout the painting. This is an abstract drawing of a flower. 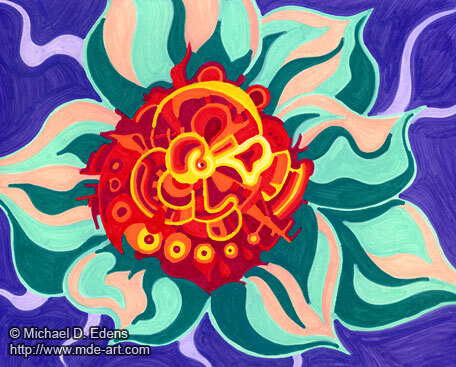 The 11″x14″ abstract flower drawing was created in 2011 with paint pens. Outlines of whimsical shapes and patterns were sketched with the paint pens using a variety of colors. Emphasis was placed on alternating similar and dissimilar colors to create unique patterns of value changes throughout the flower artwork. This is a portrait of a man with glasses. 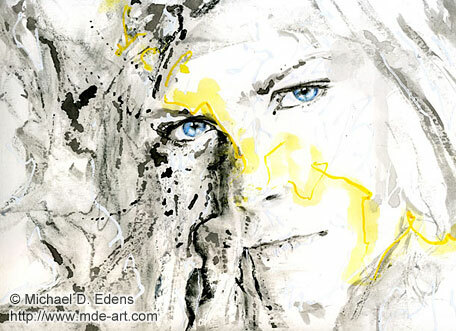 The 9″x12″ portrait artwork was drawn in 2011 with a variety of mediums, including colored pencils, pens, oil pastels, paint pens, watercolors, gouache, and acrylics. 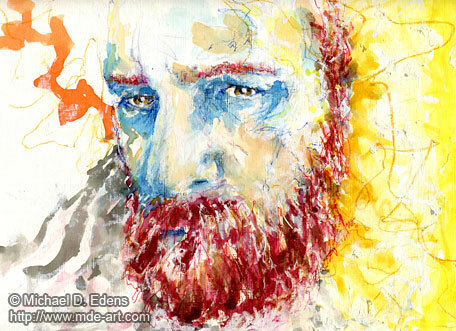 The man was sketched with colored pencils, and layers of other dry and wet mediums were applied in layers. 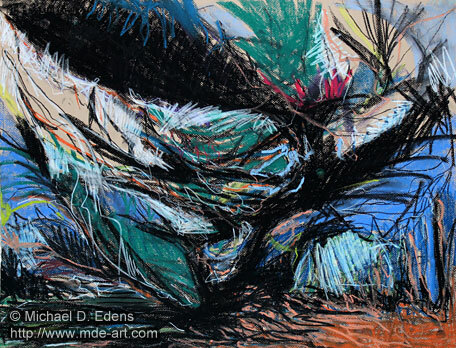 The intense and expressive lines meander throughout the artwork, creating a wholly connected portrait from foreground to background, top to bottom, and side to side. 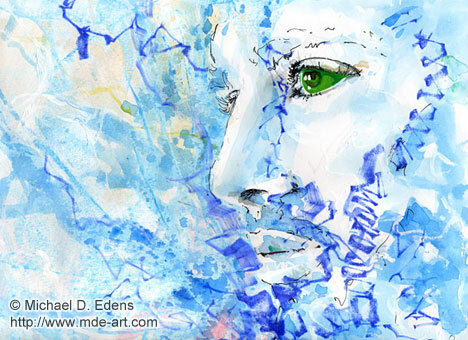 The use of unique shapes, gradients, and vivid and muted color combinations help to convey a sense of whimsical creativity and imagination surrounding and emanating from the man. This is a portrait drawing of an old man. The 9″x12″ artwork was drawn in 2011 with colored pencils, pens, markers, oil pastels, paint pens, and acrylics. 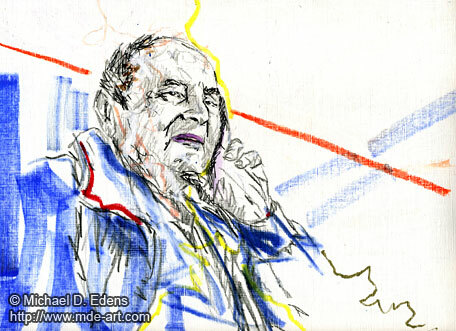 The old man’s portrait was initially drawn with dark colored pencils and oil pastels. Carefully placed lines and blocks of color were added to enhance the uneasy framework and shaky style, symbolic of old age and declining health. This is a portrait drawing of a young man with a hat. The 9″x12″ portrait artwork was drawn in 2011 with colored pencils, oil pastels, pens, and acrylics. 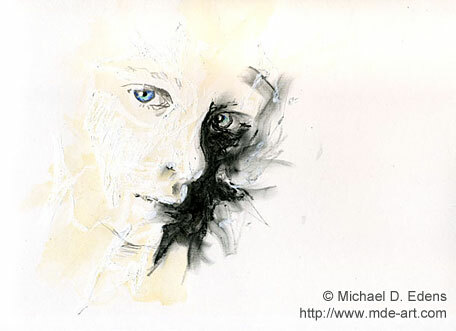 The young man was sketched with colored pencils and smudged with oil pastels in order to convey a youthful healthy glow. 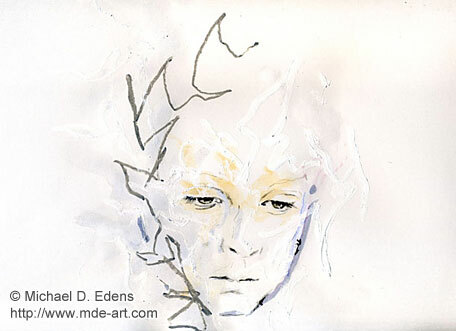 Additional mediums were used to create subtle surrounding details and textures that support the pensive yet innocent smile. 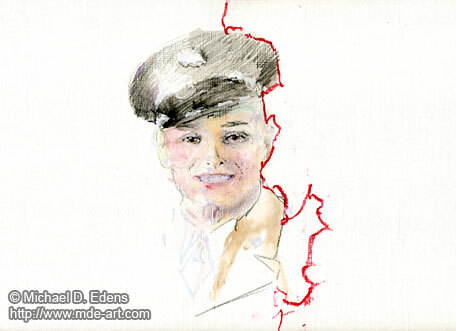 This particular young man was about to embark on his service-oriented journey as an American soldier in World War II. 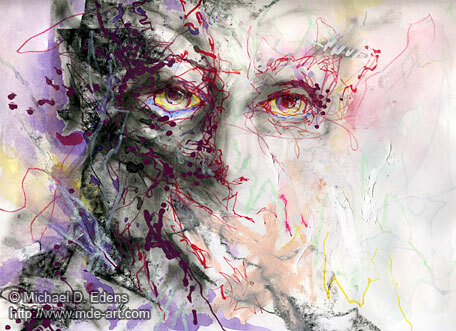 This is an abstract portrait drawing of Albert Einstein. 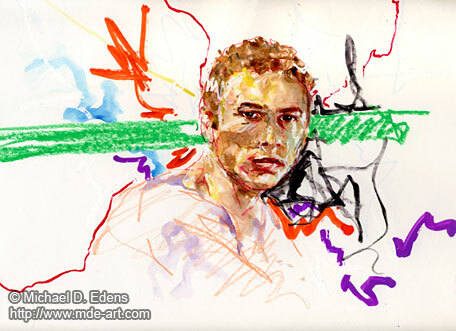 The 9″ x 12″ colorful portrait drawing was created in 2011 with a variety of mediums, including pens, oil pastels, watercolors, acrylics, and markers. 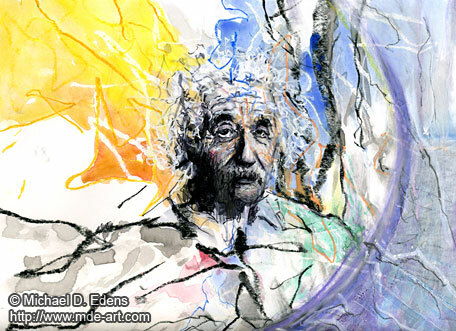 Expressive lines and vibrant colors help to create a dynamic portrait of the theoretical physicist, Albert Einstein. This is a drawing of a woman with her hands in her hair. The 9″x12″ woman drawing was created in 2011 with a variety of mediums, including colored pencils, oil pastels, paint pens, and acrylics. 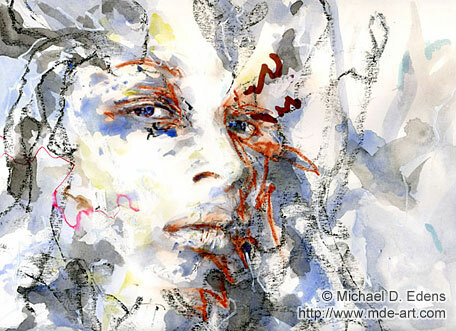 The woman was sketched with blue and pink colored pencil and oil pastel, followed by three vertical lines of silver, pink, and yellow color with paint pens. The white paper, in particular the background, was then streaked with white acrylic paint to add a subtle texture to the artwork. 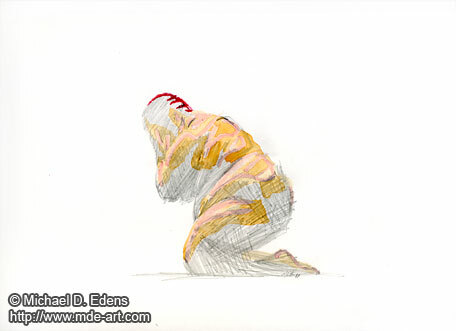 This is a drawing of a fat person kneeling with their head in their hands entitled “Overcome”. 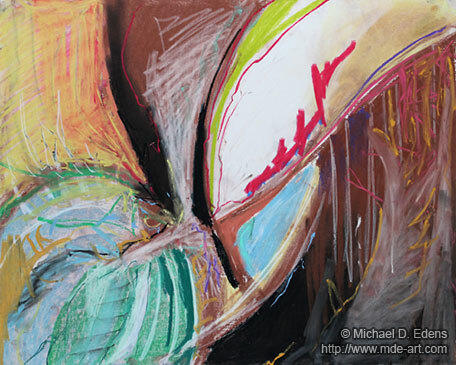 The 9″x12″ abstract artwork was created in 2011 with colored pencils, oil pastels, and watercolors. 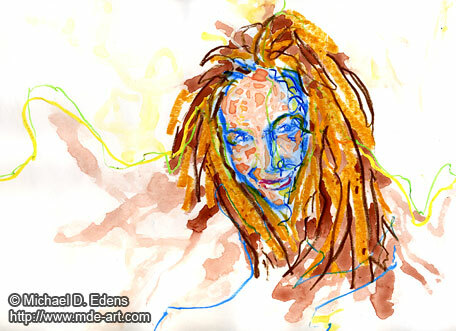 The person was initially sketched with colored pencils, followed by oil pastel and watercolor highlights. The white background creates a stark contrast against the subject reinforcing a feeling of isolation. 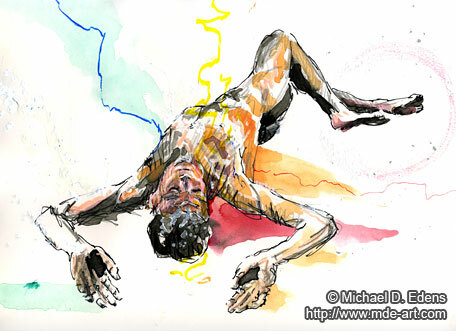 This is an abstract drawing of a man lying down. 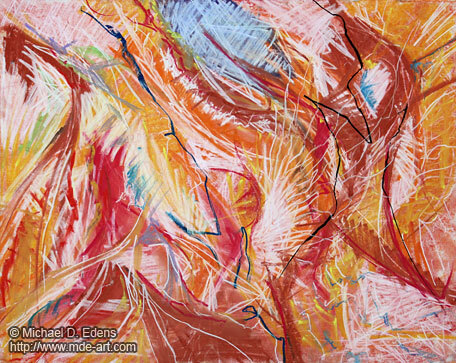 The 9″x12″ abstract artwork was created in 2011 with a variety of mediums, including pens, colored pencils, oil pastels, watercolors, and gouache. 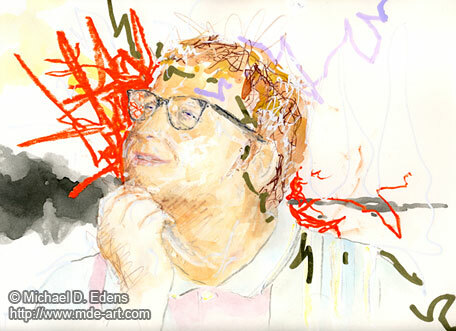 The man was initially sketched with pens and colored pencils. 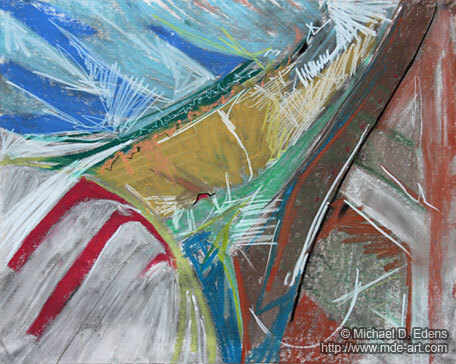 Layers of watercolor, oil pastel, and gouache were then applied to create interesting lines, shapes, and pools of color that flow from the subject and help connect the man to the foreground and background. 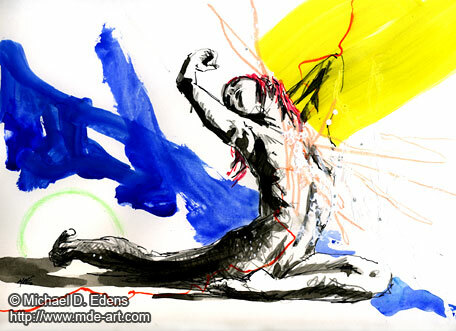 This is an abstract drawing of a woman stretching. 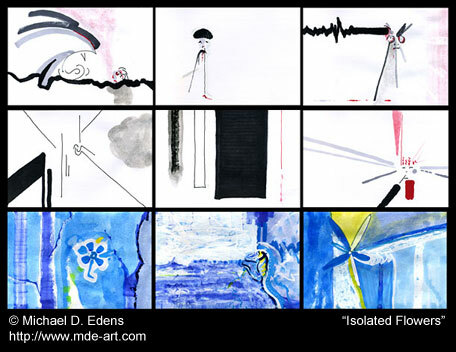 The 9″x12″ abstract artwork was created in 2011 with a variety of mediums, including pens, colored pencils, oil pastels, paint markers, watercolors, and gouache. 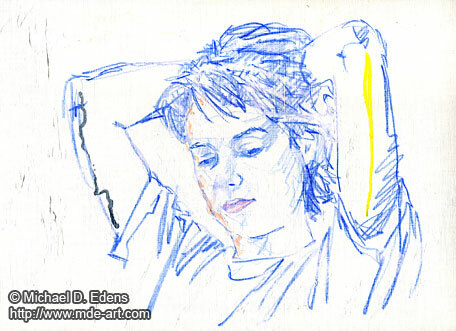 The woman was initially drawn with pens and colored pencils. 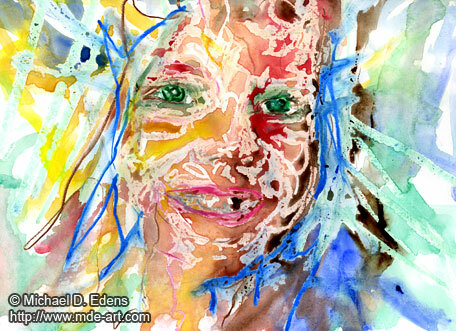 A mix of watercolors, oil pastels, paint markers, and gouache were then added to the sketch. Bold colors, expressive lines, and unique shapes and shadows help to create a high contrast and dynamic drawing of a woman.